For Swift To-Do List 7 for Windows features, screenshots and more, visit Swift To-Do List page on Dextronet.com. 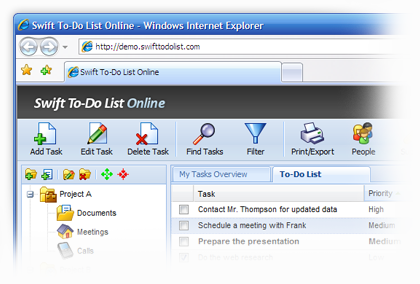 Swift To-Do List Online is a web-based version of the number one to-do list software for Windows - it's mobile, flexible and accessible from any computer connected to the internet. It allows you to easily delegate your tasks and share them with others. It's the complete solution for task management and one of the fastest ways you can dramatically raise your productivity. Simply open your favorite web browser, log-in and have instant access to all your tasks, projects and notes. Everything with just a few clicks from your web browser! You can try our live demo right now. Swift To-Do List is simple yet powerful, and also easy to use. Organize your to-do lists in a tree structure and start managing your tasks effectively. Add notes and attachments to your tasks to always keep track of things you need to know. Imagine how great it will feel to be completely organized, and to have all your tasks and notes in one place - it is really easy with Swift To-Do List. Swift To-Do List makes achievement fun. With full user management and permissions, your team, family or colleagues can share tasks and to-do lists and you can collaborate on your tasks online and track progress instantly. 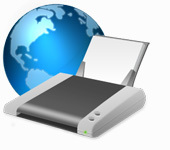 It's mobile, flexible and accessible from any computer connected to the Internet. Swift To-Do List Online is suitable both for teams and individuals who need mobility in managing their tasks. Setup email reminders for any of your tasks with just a few clicks. 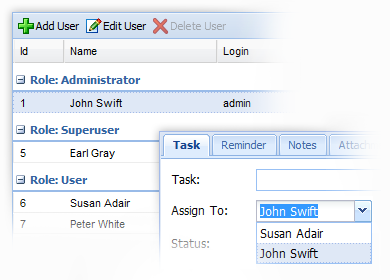 Notify people when you assign new tasks to them. Task management doesn't have to be dull, boring and annoying. 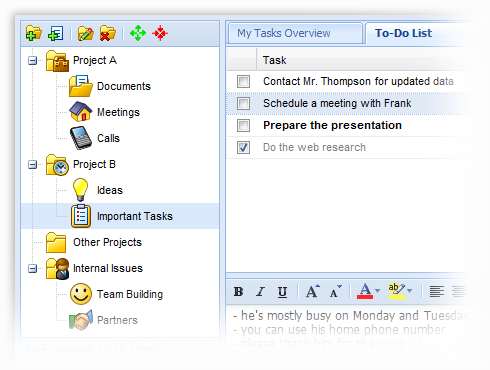 Choose from 80 icons for your to-do lists to make the task management more personal and pleasant activity. Print or export your tasks and whole to-do lists to HTML or MS Excel. Choose which columns are displayed or hidden in your print or export list, filter tasks and to-do lists to include only the tasks you want to see and much more. Your to-do lists, tasks and notes are accessible from any computer connected to the Internet. Just open your account web address in your favourite web browser, fill in your username and password and you are ready to get organized!